Ivory segmented Anglo/Indian cane. 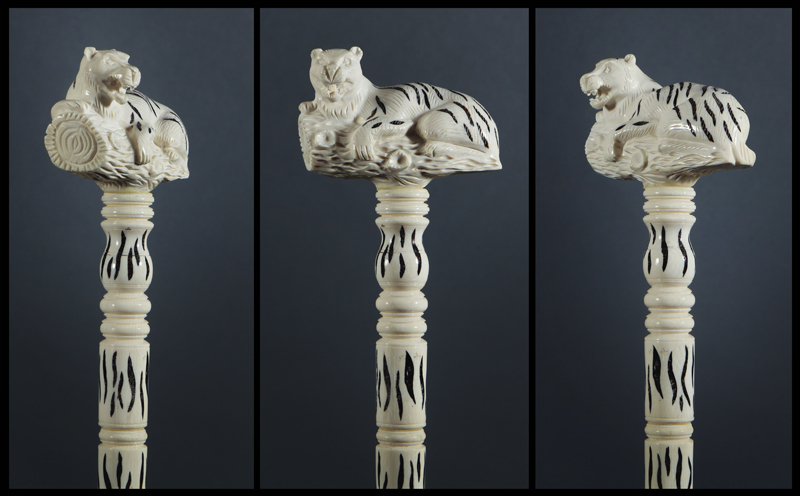 Made entirely of elephant ivory, it has a “T” handle that is 2 2/3″ high and a 3 2/3″ long. It depicts a full-bodied tiger complete with black stripes, reclining on a log. Below it are 22 ivory segments that make up the shaft. They are decorated with random, in-filled black lines. The work is superb and there are no stress lines at the connections. The overall length is 36 1/2″ and the condition is excellent. It was probably made sometime in the early 20th Century.